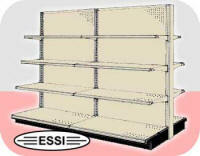 ESSI Store Fixtures Specializing in sales of Drug Store Shelving and Pharmacy Shelving and Accessories. 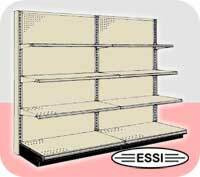 Single sided Gondolas are typically configured for a wall and can be used as an End Cap to be placed at the end of a double side aisle of Gondola Shelves. 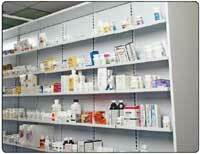 The same components are used for double sided and single sided. 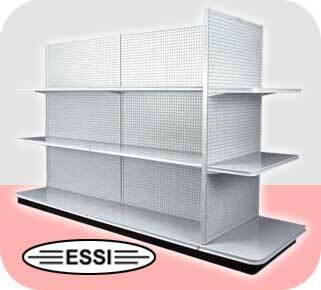 Pharmacy Shelving available in a single sided configuration designed to be placed up against a wall and a double sided configuration designed as an island configuration with all of the components available like upper shelves, dividers and stabilizer bars.